I spend a lot of time on manufacturer websites configuring various cars and trucks. Sometimes I even get paid to visit these sites in order to help a client figure out what model, trim, and options would be best. Most automaker websites are good, some are just okay, but no website is more infuriating than Volkswagen's. VW launched a new website a few months ago that was modeled after "popular dating sites." They did this in order to boost sales. I've got news for you, VW, the website wasn't the problem. In fact the old site was quite good. The configurator was easy to navigate, the pictures were large and well detailed, and the current special offers were not a maze of clicks away. I want to change the damn color on my car. I keep clicking "Night Blue," but the car stays "Carbon Steel Metallic." What is the point of having a color selector on the website if you can't see the color on the car? Where the hell are the options? There used to be a "lighting package" trim with each of these other options. Is the "lighting package" still available? Can I add it à la carte? What about the DSG? Or any other accessories for that matter. Suppose I want to add some snazzy GTI floor-mats or a roof-rack. Mini lets me do that, why can't you VW? I should not have to scavenger hunt on the internet for your press-release to know how much various options will cost then get out a calculator to add it all up. Practically every manufacturer's website does that for me. Don't force me to fill out contact information so that I can be hounded by my local dealer. Let's take a look at how it's done. Ford's website isn't perfect but it is pretty darn good. Then I can search inventory to see who I want to contact...none of this "find a match" crap. 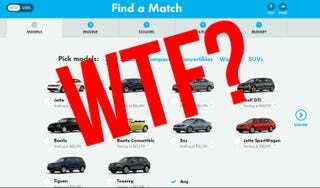 I don't know any car-buyer who wants to be "matched up" with a dealership, that sounds like a date from hell. I imagine that Ford didn't concoct some magic HTML code to make this as smooth as it is. Volkswagen I know you Germans are all about ze technology and ze engineering and you will never admit when your technology isn't perfect, but this is a frustrating mess. But when your German website is easier to figure out than your US one, and that is in a different language, you have a problem. I get that you want to be different and more "tablet friendly," but at the end of the day you just want to sell more cars. So make it easy for people to figure out what car they want.